'Samurai,' an influential gangster comes up with a very ambitious real estate project of changing the waterfront of Rome into something like LA and all the local bosses concur with his idea but the consent is not long last with state, Vatican and the gangs, all playing a part in it. 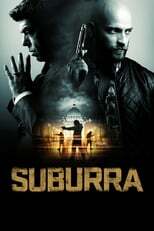 Suburra is directed by Stefano Sollima and was released on Oct 14th, 2015. Director Stefano Sollima's Crime & Drama movie Suburra is produced by Rai Cinema & Cattleya & was released 2015-10-14.